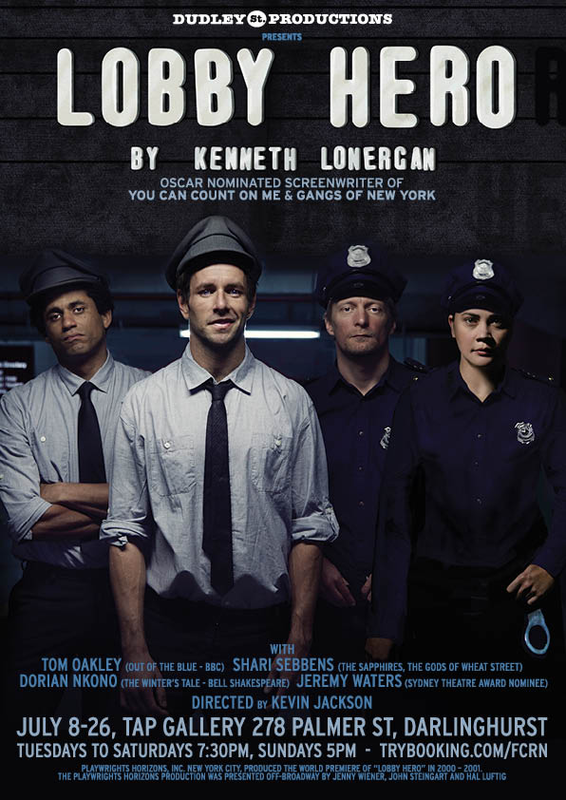 LOBBY HERO by Kenneth Lonergan at the Tap Gallery, 9th -27th July, Tues - Saturday 7.30pm, Sunday 5pm. Those of you who read my blog may have noticed a slowness in diarising, of late. Perhaps? It is because I have been rehearsing a play. That is directing one. We need you to come. At the instant of writing, I think it will be not bad. I feel kind of confident. Uh. Um. Phhh! So, PLEASE come. The actors are great and have worked hard and the play by Kenneth Lonergan is terrific. In one of my long blogs (some say diatribes), the one discussing observations on and about The Sport For Jove productions of ALL'S WELL THAT ENDS WELL and TWELFTH NIGHT I brought to your attention that most of the theatre in Sydney is produced in a Co-op manner. Meaning, that most of it is chosen, conceived, rehearsed and presented by artists from their own resources with absolutely no recompense other than the muscular development of their skills by doing, and the joy and love of creating. Practice, if it doesn't make one perfect, at least can make one ready, primed. April-May, sometime then. Tom Oakley a QUT graduate, who had been taking some classes with me at the Actor's Gym, THE HUB, asked me would I direct him in a play: THE DUMB WAITER by Harold Pinter, at the The Tap Gallery. We had been working on a scene in class. I thought, I should put my crafts aspirations, where my finger tips have been for the last few years. The Tap Gallery gave Tom a date. THE DUMB WAITER was not available. We checked for the rights!!!! - BELIEVE IT OR NOT. Bummer. A two-hander. Funny, scary AND Pinter. Just have to get the Design of the dumb waiter right in the Tap Gallery. It could have been a winner. "IN A FOREST, DARK AND DEEP by Neil LaBute." We had been working on a scene in class. "Ahhhh! Fabulous play, but the subject matter is a little full on. Especially in winter at the The Tap Gallery. Is there an audience, that will come to see two brothers dealing with the 'joy' of pedophilia? Imagine, Tom, asking your date to a little night's entertainment in July. A solid drink would be necessary after wards, I guarantee." "What about BURN THIS by Lanford Wilson. Great play. Four actors - three great roles. one good one, one of them a fabulous role for a woman. I saw the original production in New York with John Malkovitch and Joan Allen. Devastating." Tom read it. Loved It. "I am a huge fan of Lanford Wilson. Read TALLEY'S FOLLY, Tom. Two hander. One male, one Female. Beautiful, and if we could build an environmental installation set, in the Tap Gallery, it could be magical. Now, that is a date play for July. Romance assured, I reckon." Tom read it. Loved it. Rights available. BUT. "But", says Tom, "I don't know whether that is right for me." "Well, it is your show Tom. Your money. You must be comfortable." More Time Passes. Tom has a wedding he must go to in Italy - his sister's. Time, tick tocks. "Have you read LOBBY HERO, Tom? Kenneth Lonergan. He wrote and directed a really great film YOU CAN COUNT ON ME - Laura Linney and Mark Ruffalo. Was nominated and won awards for the writing etc. Great. Last year, his next film, MARGARET with Anna Paquin, with a star-studded cast, was at last released. It, too, great. The play has a cast of three men, one woman. I have a copy. Read it." Rights available. OK. PLAY ON. "Dorian Nkono as William. Just saw him recently in THE WINTER'S TALE with Bell Shakespeare. Impressed. I taught him at NIDA - amazing actor, deserves a big break, (not that a co-op is necessarily one, ha, ha! ), he played OTHELLO at NIDA: very special, although just, a 'kid', then." We met up with him at Bondi Junction. He loved the role. Yes, said Tom. We had another actor interested BUT Dorian had something that Tom liked. I like his remarkable vocal instrument and fluid, expressive body skills on top of his instincts and work ethic.. SOLD. Tried around for the other role - Bill, the Cop. Blah, blah and blah. I mentioned Jeremy Waters. I had seen him over the last year or so in a whole series of roles in the Co-op scene since his return home from a seven year sojourn in New York. Nominated by the Sydney Critics for his work in JERUSALEM, as Ginger. I think he is just great, and so dynamically right for this role - has real theatrical authority and is a really nice guy. He, also, did some classes with me at THE HUB. Tom and I met up with him at Bondi Junction, too. He was keen, even though he has a project of his own, FOUR PLACES by Joel Drake Johnson, backing directly up behind us at the Tap. Full on. He was also just about to open in SCENES FROM AN EXECUTION at the Old Fitz. He was keen. So, was Tom. SOLD. "Shari Sebbens, an ex-student of mine and a friend, we go to bad movies together (each can blame the other for having gone. It has worked so far, for us) and she wants to do one play a year. The principal companies don't see her, she says. She is 'hot' in the film and TV industry at the moment. Did you see that article about her being the Goddess of Wheat Street? What about THE SAPPHIRES? She is in the Alice at the moment making a comedy series for the ABC. Shall I ask?" "Send me the play", she replies. We do. We wait. We wait. "Yes", she says. "Check your agent, Shari." "I need to do a play a year," she says. "I need to keep in trim." Shari is an actress - she's smart, and boy, when inspired has a work ethic to die for. My gosh, she played Isabella for Aubrey Mellor in MEASURE FOR MEASURE, at Drama School, and Cecily in THE IMPORTANCE ... for me, as well. Her range is remarkable. We wait. She is in. Hurrah, SOLD. We have a reading of the play, in my lounge room without Shari, she's still filming, I read her part, before Tom goes off to his wedding. I told Shari I was great. Dorian texts me his ideas and questions. Jeremy asks when do we start? Tom gets back from Italy. We start rehearsal, early June. In my lounge room. The Tap space is not too much larger. Every day, for several hours, my lounge room is invaded by foul mouthed low lifes - my neighbours love it. "Artists in the building!" Phew!!! Two and a half hours today - then we all spread to work. Four hours today - then spread to work. What about Saturday? Sunday? Can't. Can. Ok. Fit it in. Squeeze it in. Time moves on. Producer and Publicity person on board: Elise Barton. Great. Some photographs taken - Rupert Reid, an actor, friend of Tom's. Thank god for friends when you are Co-oping. We have to fit our rehearsals around our work schedules so that we can pay our bills. Tough. We all make monetary sacrifices to do this. For some of us mounting to considerable sums. Tom is using his savings to mount the show. "British Beer Commercials", Tom says. Fortunately, most of the scenes are two handers. Fortunately, too, not much furniture needed. Or props. Find a stage manager, Caitlin Chatfield, recent graduate. Quiet, but grows in stature and reliable confidence as we proceed. I greet everybody, every morning with cups of tea and biscuits, after having re-organised my lounge room for our work. Rehearsal finished, fleeing to the bus for work obligations - sometimes re-ordering the room for my partner's sake, sometimes not! Got caught out only once. Thought rehearsal was at 10am. No, they arrived at 8.55. Still in my bed underwear (not attractive) as I opened the door. "Make your own tea." I shower, dress, begin at 9.07. Not too late. LOve the idea of rehearsing in the house - so convenient. Hmmmm? Secure a colleague from old, Pete Neville, to create the Sound Design. Relief - I know he is so great. He has created many of my productions. And I mean sometimes created them with the finish of his sound designs. Find Lighting Designer, Rachel Smith. She, too, a recent graduate from drama school, although back at Uni studying. She has an assistant. Nothing too fancy can be done in the space.. Warm colours for lobby. Cold colours for street. Anything else you can do, do please. The desk lamp can it be put on a dimmer? Will check. No Set Designer yet. Two weeks to go. Ahhhhh. Find a friend to help with costumes. Order some stuff from the US - mail order. Found, if we wanted, that we could purchase this great gun over the net, for $3,000.00! Ha, ha - as if! It even shot hand grenades! Set Designer found, Christopher Pitcairn - he, too, from NIDA. He's just finished work on a big Musical Design for a Canberra company. We check out the tiny space together at the Tap, in the dark. Can't find the light switch. We have a coffee and cake chat. He's cool. Yes, one of his ancestors was on the ship that spotted Pitcairn - hence the name connection! He attends rehearsal in my lounge room and designs the set on his computer. I mean really cool. Its simple but good. Show the actors. He talks to Tom about money and finding the furniture. Three weeks down. One to go. We move into rooms at THE HUB. Tidying the four handed scenes. Start to run the acts. This play is beautifully written. We have found an article on the net that floats the proposal that LOBBY HERO is the American play of the first decade of this century. Knocking over AUGUST: OSAGE COUNTY and others. We are prepared to run with that proposition. Come and see it to debate it with us. I certainly think it has legs to that claim. I've always thought it fascinating. Tremendous. It is a play about four blue collar strugglers. The every men, the low men (Lomans) of the American Dream. In a lower depth in a lobby in Hell's Kitchen in New York just before the Towers came down. In fact this play opened just before the disaster - maybe that's why it got kinda lost to history. Jeff, William, Bill and Dawn all have aspirations to change the world, but find the world changes them. Inevitably. Almost, irresistibly. They try to tell the truth. The society forces them to inch over their ethical boundaries, even at this level. The aching humanity is quite disturbing. The writing of the dialogue is a minefield of complication for the actors in sorting the author's intentions. The vocabulary is very particular. The syntax - ellipse, pause, silence - forces the actors to think so often, that the performances appear to be spontaneous improvisations of dialogue in action. Hard to learn. Hard to perform. "Is that a pause and ellipse, or, just a pause, or, have you forgotten your lines?" "Don't speak, yet. I'm still acting. This ellipse into a Pause is killing me." "Oh." Run the play. Oh, my. This play is good. Can we match it? Well we're not doing to badly. It is long. Two and a half hours. Plus an interval. Old School. Mr Lonergan's film MARGARET is 177 minutes long and it doesn't really feel like it. The human dilemmas are so real. True for us as well. The play can flash by. That's our goal. Uniforms arrive from the US. Hats not with them. Got the badges. Caught up in customs!!! Yikes. Run Friday. Good. Pete came in to synchronise his plans for his sound. Saturday, get graphic photograph, on the net, of Dorian's calf all bloodied and torn up after an accident with a glass coffee table! He'll 'soldier' in for another run Saturday night. Run, rough. All of us slightly dazed by Dorian's courage. Hmm. I run off to a friend's 50th birthday party. Get home. F***K! The Hot Water system has gone bung. "It is F***king winter, man." I begin to sound like the characters in the play. Move into theatre on Monday afternoon. Venue not available till then. Rachel will set up lights. I will see the furniture etc for the set then, for the first time, though I have approved it on the internet. Pete can't get in to tech. He has a job that he has to do!!! Will have to tech the sound on Tuesday Afternoon. Make the Tuesday night a Dress Rehearsal with a few friends -that we can trust to love us!.Ha. Some days I just want to kill myself. Other days I have quite a good time. Then - Ellipse - Pause. But, never, a Silence. My brain can't keep silent. Everything whirrs. This is a modified account of my journey to present this terrific play with these great artists. This is a small insight for all of you who read my blog as to what is going on in this city, outside the major theatre companies to present work for you to see. Consider the LOBBY HERO as a desirable object of your time over the next few weeks, please. From 9th July - 27th July. Tues -Sat 7.30pm. Sun 5.00pm at the Tap Gallery . Corner of Palmer and Burton St. Darlinghurst, across the road from the Eternity Theatre. LOBBY HERO has been developed with the co-operation of THE HUB - the Actor's Gym in City Rd. Chippendale. This is wonderful - Ellipse - Pause - actually this is EXCELLENT! I can't wait to see Lobby Hero! Thanks also KJ for painting such a hilarious and accurate account of the improvised, jolty, soul bearing, collaborative, thrifty, nail biting, racing against the clock, familial journey we go through to keep independent theatre alive in this city! Ain’t nothin like flying by the seat o' yer duds in the name of producing great (and on occasion not so great) work. Just wanted to post on this to say how excited I am to see you once again in The Directors chair. I am just sad that I now live in Melbourne and won't get a chance to see it. All the best with the show. Warmest Regards. Seton. This is a performance that lovers of high-quality acting should make sure they see. All four actors contribute complex, detailed characterizations as they edge their way through the play's tense and funny confrontations. Mr Lonergan's gift to them is his characters' expansiveness - their frustrations burst forth in mushrooming clouds of fiery dialogue. These are people trying to keep it together in a tough and rarely forgiving world. But whatever the setbacks, they want to connect and have a capacity for openness, and the feeling sometimes bursts from as they fight for an unshakeable sense of what's right or what's due to them. We are, of course, somewhere in the New York of perhaps our experience and for sure our crime-drama-fed imagination; one of the achievements of the cast is to seem so authentic. You would be hard-pressed to pick a note or gesture that seems out-of-place. And their director has orchestrated their contributions to give variety and tension to our journey through the ethical, professional and romantic dilemmas that Mr Lonergan sets up. This ensemble eventually reminded me of "American Hustle", the recent movie in which five star actors seized on the opportunities provided in a script Christmas-stocking-full of near preposterous, fighting-grasping characters. But well before the connection was made, Shari Sebbens, Dorian Nkono, Tom Oakley and Jeremy Waters had established something for us that was their own, and its quality had nothing to do with slavish imitation. Congratulations to all concerned! And Kevin,even if your hot water system remains on the blink, you will see out the winter with a warm inner glow of justifiable pride.